The Yoga Sutras of Patanjali (an ancient yoga text) describes eight limbs of Yoga, each of these limbs relates to a facet of living a healthy and contented life. The third of these limbs concerns the practice of yoga poses, and the fourth the practice of breathing exercises, these two limbs combined make up the practice of Hatha Yoga. "Yoga cannot cure every condition, but it can substantially help most of them." Hatha Yoga is the type of Yoga most practised in the West, and is often considered to be an alternative or complementary medicine practice, having won respect in the mainstream medical community. It consists mainly of poses which are designed to increase strength and flexibility, and controlled breathing. Movement and breathing are combined to help you move smoothly from one pose to another. The Yoga poses and breathing techniques form a self-care system designed to rejuvenate the body and free the mind from tension and fatigue, it’s so much more than just exercise as it not only works on the major muscle groups to shape and tone, but reaches the deeper postural muscles that maintain the health of the joints and spine, while also stimulating the function of internal organs helping them work more efficiently. When the poses of Hatha Yoga are practised, the aim is to give full attention to what we are doing and how we are doing it, with the clear intention of deriving benefit from it. We ensure a pose is comfortable and stable and that our breath can flow smoothly, this focus encourages the mind to be peaceful and quiet which in turn helps to balance our mental functions, a Yoga pose could be described as a meditation in motion. This soothing meditative effect on the brain has been verified by EEG data, it has great healing implications and helps us develop a more level headed approach to life. Patanjali further suggests that the practice of Hatha Yoga creates health in body and mind and will harmonize the flow of life force within us, and from this grounding a fertile field is created for the evolution of the spirit. It is worth noting at this point that Yoga is not a religion, this is a common misconception in the West, which has perhaps come about because some eastern religions also practise Yoga. There is nothing in Yoga that requires anyone to embrace a particular set of beliefs, or worship any deities. “Yoga has a sly, clever way of short circuiting the mental patterns that cause anxiety”. It can be helpful to think of these eight limbs as being the arms and legs of a child’s body, connected to each other via the central body of Yoga. Just as a child’s arms and legs grow in proportion to one another, whatever limb of Yoga we practise the other limbs seem to develop alongside. 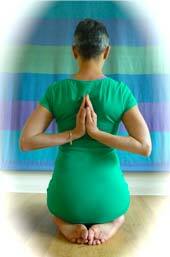 Often a person will begin with posture and breathing practice and is then drawn to meditation, or vice versa. Just as the development of each arm and leg is necessary for optimal body function, every limb of Yoga has an important purpose too. Non violence, Truthfulness, Non stealing, Non lust, Non acquiring. Cleanliness, Contentment, Sustained practice, Self study, Surrender to life. Asanas: Postures to keep the body strong, flexible, and relaxed. Pranayama: Breathing exercises, and control of life force (prana). Samadhi: Union with the Divine, sometimes referred to as enlightenment.